At Cheam High School, we believe in the importance of developing students’ enjoyment for reading. This is promoted through a range of activities throughout the school year. We want all students to challenge themselves when it comes to reading. Below, are just some of the things that we do. 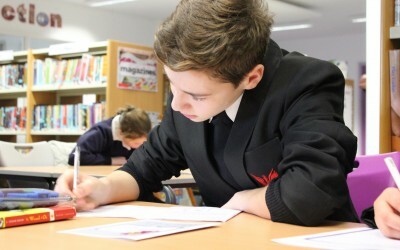 The Reading Challenge is run by the LRC and English department where students are given the opportunity to complete a Bronze, Silver and Gold reading booklet in order to win tutor points. For each booklet, students must read four books and complete four different activities to earn their points and move up to the next level. Further to this, we also give students dedicated reading time through the use of termly LRC lessons. This is a great opportunity for students to sit back, relax and enjoy their book. In addition to the Reading Challenge, students are expected to read for 30 minutes each week as part of their English homework and this is to be signed by parents to confirm. We also give students Reading Record booklets which contain updated reading lists and tables to record reading and new vocabulary in. Students are also rewarded each time they complete a page of reading in their booklets. Students complete a range of activities and competitions to celebrate this event. Students created an A – Z on reading; tweeted about their favourite characters; took pictures of themselves reading and year 7 tutor groups decorated their classroom door as a book cover. The Carnegie Medal is an award given annually to the writer of an outstanding novel for children. Each year, the English department gives keen readers in years 7 and 8 the opportunity to join a Carnegie Medal Shadowing Group which involves reading and discussing novels from the Carnegie Medal shortlist. After students have read and discussed these novels, students decide which novel they feel should win the award.